I try to filter both variant non-variant sites together. I see the only reasonable way to do it is to filter by the per-sample DP. However, I noticed that substantial fraction of called sites (~10%) have missing value in DP field ( . instead of 0 or other value). Although many of sites with missing DP values indeed have low coverage with bad mapping and called ./., some sites have in my view good coverage. When I check the bam file (-bamout result) in IGV, I see many reads mapped to those sites with good quality (MQ=60). 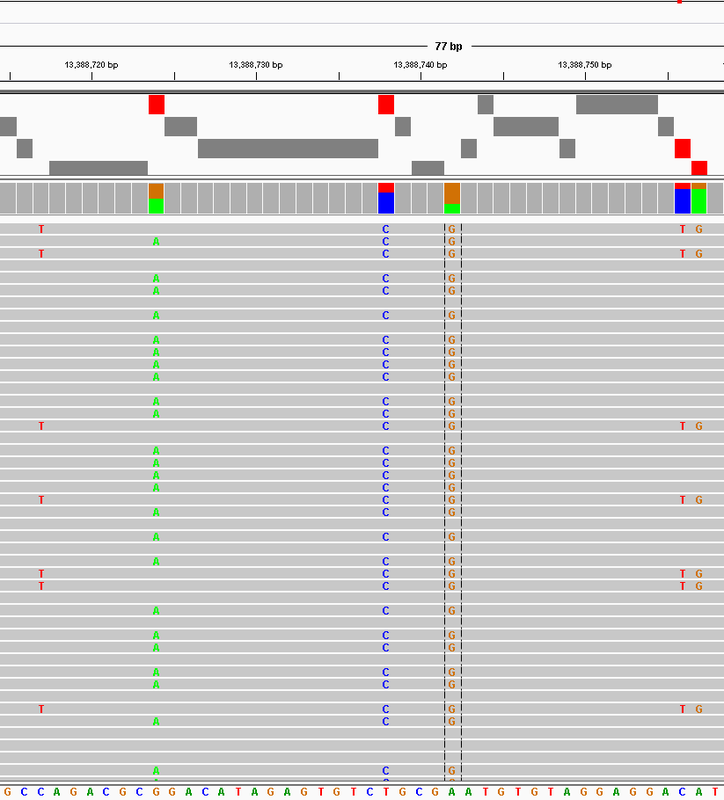 The genotype is usually called correctly, but for some unclear for me reason GATK doesn't report DP values. The AD values are usually 0,0 in such sites. Interestingly, the nearby sites have DP values reported. When I check gVCF files, these sites usually have DP=0. Assuming coverage of 0 I could discard these sites, but I see in a bam file that it is not 0. So, I do not want to throw away 10% of my data. I generated the data using HaplotypeCaller in GVCF mode and then GenotypeGVCFs. Could you please tell me the reason why this is so? Which version of GATK are you using? Can you please post the GVCF record for the sample (with the 1/1 genotype) at that position? Also, please post the original bam file and bamout file for the sample at that position. Well, I was little wrong about 10% (it was including ./. ), there are very few sites with called genotype and missing DP and I can safely ignore them. So, the problem is not critical for me. However, I found another threads with similar question and it might be a bug. It would be good if GATK emitted actual DP values instead of missing (.) even if it is 0. Actually, this is not related to the threads you referenced, but there is a bug in the issue tracker that is similar to what you are reporting. You can keep track of the status there.